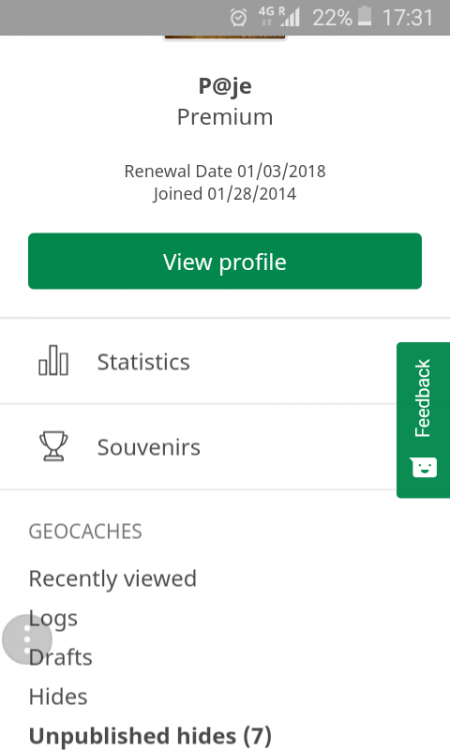 With this release, we are updating the header on Geocaching.com with visual changes and revised content in the drop-down menus. A link to the Help Center was added to the user account drop-down menu, between “Settings” and “Sign Out”. The Help Center link in the footer remains. 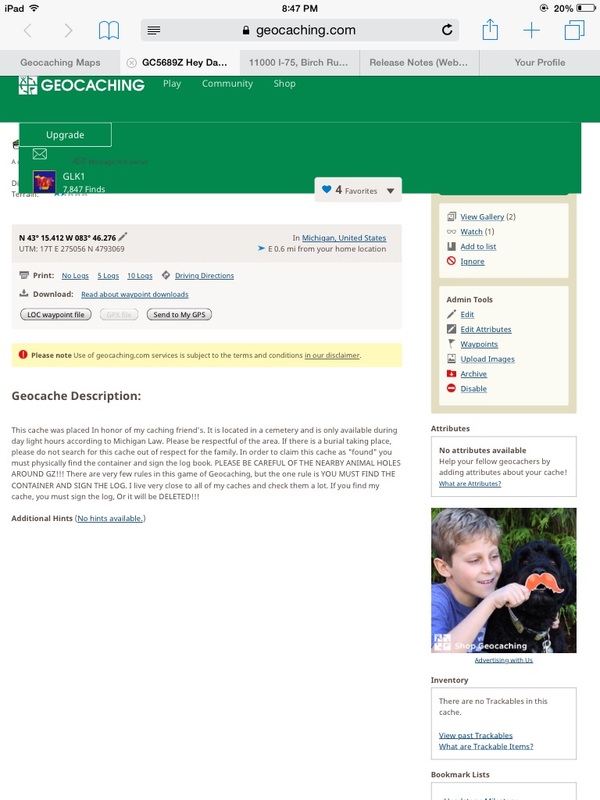 * Geocaching 101 is now accessible from the updated Help Center. * To highlight Search and Map, we added icons next to the text. * Drafts has been removed from the drop-down, as it is accessible from the Dashboard and /my page. * Added a link to purchase a gift membership. * Added a link to purchase bulk trackable codes. It may take some time for the update to make its way to everyone. Nate R and Jayme from HQ’s Product Team are watching the thread to answer questions whenever possible. Any posts in this thread should relate to features in this release. Unrelated posts may be removed. Please direct unrelated comments to other appropriate threads. Thanks! Is this released to everyone? I tried a couple different browsers and incognito mode as well as with developer tools on and caching disabled and I'm not seeing any icons in the drop down Play menu. I don't see any new links in the Shop menu. It may take some time for the release to make its way out to everyone. We'll update the post to reflect that. 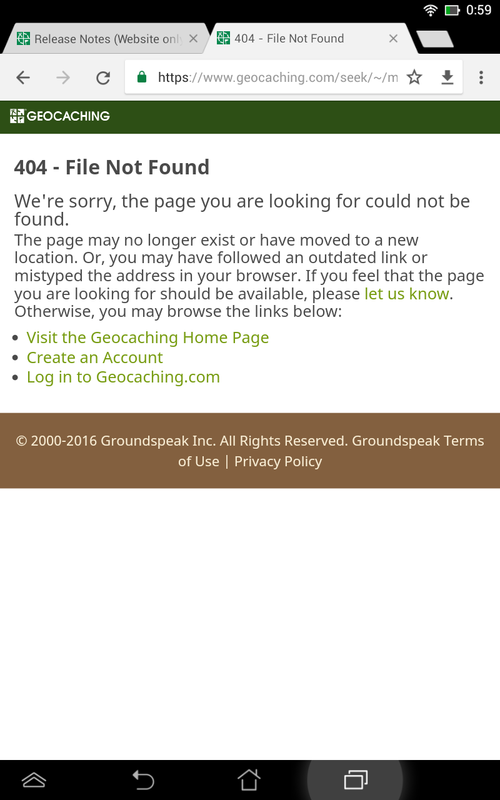 At my account, click on the 'View map' link, brings me to https://www.geocaching.com/seek/~/map/ and i get a 404 page. We're sorry, your request has resulted in an error. The home page and some other pages are returning a 500 error now so I expect they are dealing with a larger issue. We've had a server decide to go down. The engineering team expects the issue to be resolved shortly. Thanks M.Bike. I was in the middle of something and I broke the server. Back up & Running!! Thanks Guys!! Hmm... I guess I need to update the background used in my geocache listings to match the new color scheme. Nope, still broken...I am getting the 500 error when trying to look at a cache page as well as being required to log in when the system does find a page. So I can log in now, but the profile page is all messed up. Is the header supposed to be centered? and what is the mysterious box on the right side of the screen? I assume my number of finds/hides/trackables will be returning to my profile soon? Tomorrow's project? And the location bit has disappeared as well. Update on this - click on the 'Search' does the same thing - it brings me to https://www.geocaching.com/seek/~/play/search/ which is a 404 page. Luckily, landscape mode made it go away. From a cache page, the "Search" function on the "Play" drop-down menu goes to a "404 - File Not Found" page. On my profile page, the Search function works on the Play drop-down menu. I don't have that problem in Firefox. What OS and browser are you using? Hey gang! Thanks for all the extra eyes on this one — this change has a huge amount of surface area, so QA's been challenging. We truly appreciate the bug reports, so please keep them coming as you come across them! As mentioned, we did have some stability issues last night that stopped us from deploying the updated header to all parts of the site, which is why the homepage and other areas have yet to be refreshed. We are pushing to resolve this as soon as possible. Thanks for these! We've got fixes on the way already. We've temporarily rolled back a portion of the site that we believe might be causing issues with some scripts in the hopes of identifying which ones have been affected by the change before re-deploying. Thank you! Am I the only one that really dislikes the new green theme color they have chosen for the new website layout? The pine green they already use or a more emerald green would look 10 times better. The coloring overall seem to go downhill and is annoying on the eyes. It's good to see that the Play/Community/Shop dropdowns have been consolidated with the avatar/messages links in the top bar, for the profile page. Will this configuration be rolled out to all the pages? I've got a problem with pocket queries. When I preview one, the caches come up sorted by distance. I click on the 'placed' hyperlink to sort them by placed date. This works for the first page. However, when I click to go to page 2, even though "sort=placed" is still in the URL, it reverts to sorting by distance. I have not been able to figure out how to continue viewing caches sorted by placed date via the PQ interface. I know for a fact that this worked Monday morning, but by yesterday (Wednesday) it was working as I described here. Given the time frame, I'm guessing this is related to the changes that were recently made? Maybe? Am I the only one that really dislikes the new green theme color they have chosen for the new website layout? I don't mind it. I have enough olive drab in my life; I wear it to work every day. I actually like the color they chose. I could care less which color they choose though. It's just a color on a website.. it makes no difference to me. If I'm using the new dashboard, it shows my 'Hides'. In my homble opinion this is not completely correct since it also includes all my events (which are nót hidden :-) ). I hope I posted this in the correct forum group. Maybe just change it back to simply "Renew"? Ah! Good find! We'll look to make this change in our next update. Thank you! As of today, the last major swath of the site should be updated. I'll keep checking in with this thread for any issues that crop up, so please keep us in the loop! Thanks, everyone. I see it's already been changed. Thanks! I'm seeing this in IE11 on two different computers, but it looks as expected in Firefox and Chrome. 1. It's wasting space again, similar to the new dashboard and such. Just don't get why the top bar needed to get higher. 3. Could it be that the email link within the cache page isn't there any more!? Or do I simply just remember that wrong? 4. The Geocaching logo as well as the big text seems to be blurry, like just been expanded. I checked the size and even if it SHOULD have been the same (196*29) it is about 10% bigger. I compared the code and it slightly changed. From absolut size to some automatic one I guess. Yikes. Ok, we'll add this to the list. Thank you! Hopefully, this is LESS wasted space in most people's eyes: We basically had two headers before, a white and a green one, one on top of another. This release has consolidated these into a single line, reducing our vertical header space by HALF and bringing more content "above the fold," as it were. As for the e-mail link, do you mean the link to mail the cache owner? If so, that's still there. Nothing should have changed down-page as a result of this release, but if something's missing that should be there, let us know! "Wasted space": Hmm, I was referring to the map page for instance, as this ist my most used one. The top bar is higher now, with just the same info. By accident I just had them side by side as I still had an open tab with the old style. Sorry, as I don't use a single of the newly changed pages for several reasons I can't tell if it went better there! Email-Link: Sorry, I'm not sure if there really was one or not. I THOUGHT there was a link like the "Message this owner" link. Color: Could be my exact monitor already shows green colors a bit more prominent than other monitors. But compared to the old matte green it really is sooo bright, especially at night and the contrast to the map colors is pretty big. Agreed, I was a much bigger fan of the prior earthy-green hue and saturation. Less loud and bold, more flexible, imo, for other design concepts and in line with the geo-nature of the website. I also preferred to previous green, which seemed darker. For me, the white text stood out better against that darker green background. There isn't as much contrast between the text and the header background now. 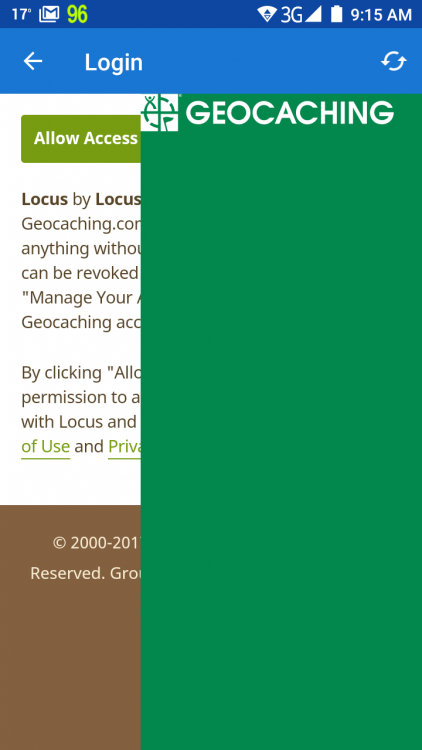 I noticed this lack of contrast earlier with the color change to the 'log geocache' button on individual cache pages, but didn't think much of it. Besides the color change, I like that the horizontal menu has been moved up into the green banner. It's a concept that's similar to a mock-up I did a while back. It saves space having the menu and banner in one line, rather than stacked. Don't know if this is the correct page to post. I can't see the cache name, D/T or log a cache from the cache page...this is what I see on myiPad Very wide green on the yop of each cache page. Imam having the same issue on both my iPad and Mac, using Safari. My friend sent me a picture of his tablet screen and it looks exactly like this one. He is very angry because he can not use the service normally..
Have also got large green header as others - on Mac laptop. Have found a work around for logging caches but new to trackables and need to log I have discovered some. Can't do this and have also got a travel bug in my possession that I need to move - the first time I have tried to do this (after quite a lot of encouragement to do so from host of 1 day event on Int Geo Day). Not brilliant on sorting out computer problems and would be very grateful if you can get rid of it. As it is peak holiday season and school holidays in UK I am sure others are also similarly frustrated. Yikes! We will look to fix this ASAP! Thanks for bringing to our attention! Is there a plan to include the "Play" / "Community" / "Shop" menus in the header of the map page? At some point, yes. Those buttons weren't there on the map page before this change and we didn't add them during this step for expediency's sake, but as we make further changes to the map, the intention is to add those there. As a reminder from the original post in this thread, posts in this thread should relate to the release. We've removed a few unrelated posts, but you're welcome to share suggestions for future features in other threads. Thanks! @arisoft @Dread_Pirate_Bruce @GLK1 We're having difficulties reproducing this tablet-display bug internally. Can you confirm what device, browser, and OS version you are seeing this on? Our suspicions are that this is only happening on iOS 8 and below, but can't be sure until we have more info. FYI - The renewal button doesn't appear consistently across different pages. It may be worthwhile to go through the various pages and make sure they're consistent. Shows "Renew mem..." on the 'new' logging page, Search page, Hide a Geocache page, and Friend League page. Shows "Renew" on the new/old Dashboard pages, the new/old Profile pages, the new/old Drafts pages, and the Volunteers page. Shows "Renew" (bolded) on the Pocket Query page. Doesn't show at all on the Trackables page.